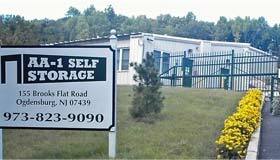 Cheap Self Storage Units with Everything You Need! Looking for cheap self storage units that offer everything you need for an incredible value? We are your one stop shop for storage! We offer Climate Controlled Storage, Non-Climate Controlled Storage & Outdoor Storage. At AA-1, we make sure your valuables are Safe & Secure with Well Lit Paved grounds and 24 Hour Video Surveillance System. We are conveniently located in Ogdensburg between Franklin & Sparta, Sussex County, NJ on Brooks Flat Road, Just Off 517. We serve the following areas: Ogdensburg, NJ; Newton, NJ; Hamburg, NJ; Sussex County, NJ; Hardyston, NJ, Sparta, NJ and more!